Updates on Android App Development Guidelines Announced by Google. The announcement about API Level: The API levels play a crucial role in developing a secured and protected app. The guidelines in this category are applicable to implied targets for blindService() Android 5.0 version which is no longer supported, runtime permissions in case of Android 6.0, user added CAs that have lost the reliability for secured connections in Android 7.0 and apps that are not able to access the account due to permission from user in Android 8.0. From August 2018, the new apps will require to integrate the API level 26 and further follow the updates in November 2018. Google has also spoken about the advancement in the targetSDKversion which will come into effect from 2019 onwards. 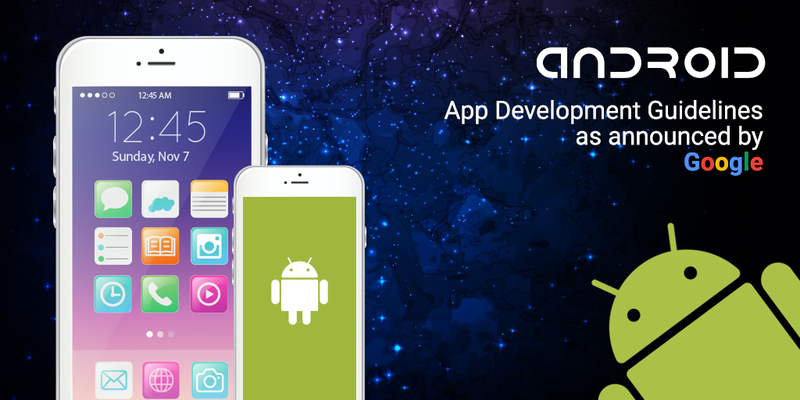 Thus, app developers have to now be on foot to meet the existing and the latest upcoming API levels. The apps which don’t receive any update instruction will not have any impact on them but those apps that do not target the API levels will not be allowed to release. The developers have given the freedom to choose their minSDKVersion in order to keep them free from the hassle of changing their development process. Building 64-bit version: Google has made compulsory for Android app developers to build minimum 64-bit libraries for the apps to enter the Google play store. This change will come into force from August 2019. The announcement has been made well in advance in order to ensure that by 2019 all apps are made compatible to run with a 64-bit processor, leaving a negligible scope for problems when the 32-bit processor is stopped supported by Google. An entire set of new instructions and registers will be out to make the apps as per this new update. Following this update, we will witness a big difference in performance of Android apps, however, this update will only be affecting native apps and the rest of apps can run smoothly without major jolts. Security Metadata: The final and the most crucial announcement which will come into force by early 2018 is Security Metadata. Here Google plans to add an extra layer of security metadata to the APKs of Android apps which are to be submitted to Google Play store. It can be regarded as an authentic level which will make an app even more secure and reliable. As an app developer, you don’t have to do anything here. The Google itself will increase the size of APK to add small metadata and insert it into the APK Singing Block. There will be no change in the functionality of the app. Only there will be a teeny weeny increase in the size of the app and that will require a little extra space in the device of the user. The metadata offers distribution chances and thereby helps in keeping the app updated. So, when all the three updates are announced with one intent i.e. to increase the security and performance of apps then for sure the future defiantly belongs to Android apps.